Reflections and Ruminations: Good spirituality will always necessitate embracing the Golden Mean. Good spirituality will always necessitate embracing the Golden Mean. In philosophical language, evidenced in the teachings of Aristotle, there exists the call to live out and identify the Golden Mean. This Golden Mean is the middle of two extremes, where on the one hand there exists excess, and the other, deficiency or lack. The Grecian mind saw much beauty in balance and symmetry, and this is reflected in this philosophical axiom that they promoted. But even in the world of Chinese philosophy, there exists something that advocates a concept that isn’t all that far from their Greek counterparts. Called the Doctrine of the Mean, this was taught by Confucius. Often, this is interpreted as the maintenance of balance and harmony that allows one to direct one’s mind to a state of constant equilibrium. It represents moderation, rectitude, objectivity and propriety. One should never act in excess. When this is misunderstood, it can lead one to think that virtue and truth are found in mediocrity, which is not what these teachings inculcate. What they, and all good spirituality point to, is that all virtue and truth, all righteousness and principled living somehow require us to avoid extremes, and live in some healthy tension inside of an accepted ambiguity. And this is extremely challenging, simply because our broken and sinful human nature finds it much easier and comfortable to live an “either/or” existence, where there are clear demarcations, rather than locating and staying in the middle where neither side can be easily offended. Rather, virtue and truth have to necessarily include some form of a “both/and” existence. The world has been careening from the effects of religious extremism where people on the extreme side of “left” or “right” become purveyors of terror and victimizers of unsuspecting innocent by-standers. And we know thus that extremism in any realm has inherent flaws and darkness. 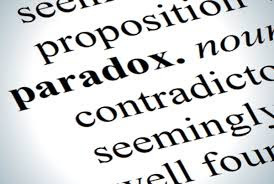 Yet, we also do know that rich spirituality is often bridled by what is known as paradox, and this is often God’s teaching mode of choice because it requires of us to discern, to ponder and to be constantly on the alert to teachings that present themselves to us in and through our very lives. Those familiar first eight verses of the third chapter of the Book of Ecclesiastes also speak of this in the reality of our lives. In 1965, the song “Turn! Turn! Turn!” was a massive hit for the group The Byrds, and the lyrics of that song were predominantly made up of those verse references. Positing that there is indeed a time for everything, it can also be understood to mean that life really does balance and move in the mean of the various extremes. And we will find ourselves at each moment of our lives, reflecting on and making sense of those essential categories of life – living, working, emoting, gathering, being intimate, finding, creating, and very importantly, loving and holding that tension between conflict and peace. Of course, the key-teachings of Jesus are often expressed in paradox. Some of them you may already be familiar with. God’s incredible plan of salvation was to be revealed to us through the vessel of a Virgin and Mother (Catholics, deal with this! ), paving the way for His becoming the apogee of paradox – God and man. If we haven’t yet got a sense of this, we may have indeed be missing the forest for the trees.